Augusta, GA: It is the smile that only a Masters Champion can boast. 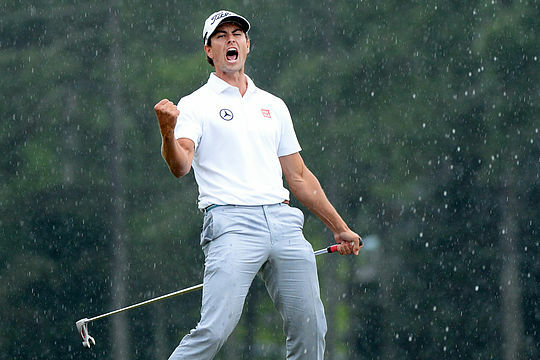 Three years ago Adam Scott ended a 77-year wait for an Australian-born golfer to be fitted with a Masters green jacket. And this year, on the 20th anniversary of Greg Norman’s heart-breaking demise at Augusta National, Scott spoke of the joy three years after winning the Masters and what it is like to return to these hallowed grounds as a Masters champion. “This is a week where it’s very hard for me not to walk around with a smile on my face,” he said. However Scott then revealed, at age 35, he’s very conscious to make the most of the ‘window’ on his career he admits is slowing closing. “It’s hard for me to think that anything I achieve will be bigger than that moment in my career than winning the Masters, but that doesn’t mean I’m not striving to win other Masters Tournaments or any other big championship,” he said. And it prompted a follow-up question to Scott if he thought he could still win at the game’s highest level. “I don’t spend a lot of time thinking about it which is probably a good thing, because it means I’m not quite there yet that I have to worry about it,” he said.